Ishii Shōkai was a Japanese distributor in the 1930s and 1940s. It used the brand name Echt on a number of products, and was running a dependent manufacturing branch called Echt Kōgaku Kōgyō in the early 1940s. Ishii Shōkai survived the war, and placed advertisements in the March and April 1946 issues of Ars Camera. These documents say that the company was ruled by Ishii Yūzō (石井有三), certainly the founder, and make no mention of the Echt products. By 1955, the name of the company was K.K. Echt Shōkai (㈱エヒト商会). It was selling an Echt exposure meter, which displays the same logo as the prewar and wartime accessories. All trace of the company is lost after that date. Mikami Makoto (三神誠), founder of the Matsushima camera distributor, was a former employee of Ishii, and Nukui Teikichi (貫井提吉), founder of the Nukui Labo repair shop, was a former employee or subcontractor working on Echt products. The two men made acquaintance at Ishii, and it was Nukui who introduced Ogihara Akira (荻原彰), founder of Orion Seiki to Mikami, who would distribute Orion and Miranda products for various years. 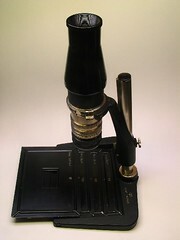 The most complex Echt device known so far is a copy stand for the Contax, called "automatic focusing copying device" (自動焦点式接写器). 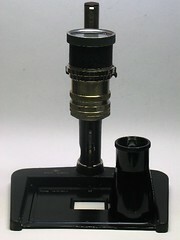 It is a close copy of the reproduction stand 5520/1 made by Zeiss Ikon. It comes in a black box, with two stages to contain the various components of the set. 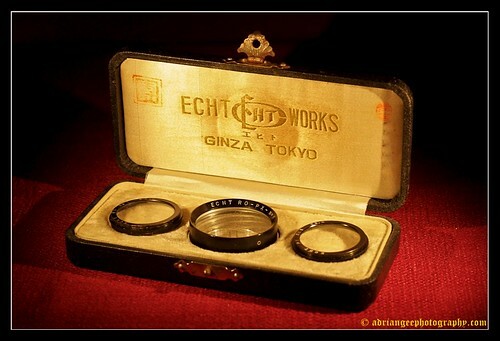 The green velvet lining inside the box lid shows the ECHT logo, the Japanese characters エヒト, the device name, the company name ECHT KOGAKU and the address GINZA TOKYO. The name ECHT WORKS is inscribed on the base of the copy stand, together with Echt's logo. The particular example pictured in this page has number 106 engraved at the back of the base and on the fixed and moving parts of the column, and number 282 engraved under the base. The device was certainly produced in very small numbers. 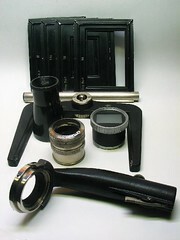 a portable copy stand complete with close-up lenses, whose user manual shows the name "Echt repro device for Leica" (エヒトライカ用接写装置); it includes a special adapter ring for the Leitz Elmar 5cm f/3.5, marked ECHT Elmar 3.5; the name ECHT WORKS and the address GINZA TOKYO are inscribed inside the box, together with the ECHT logo and the Japanese characters エヒト. film cassettes for 35mm cameras (c.1939), available in Contax and Leica versions. ↑ 1.0 1.1 Column in Asahi Camera January 1939, p.189. ↑ The address appears as Ginza 6–4 or as Ginza Nishi 6-chōme Taimei Shōgakkō Mae (座西六丁目泰明小学校前), "facing the Taimei school". Source: column in Asahi Camera January 1939, p.189, and advertisement on p.7 of Nihon Shashin Kōgyō Tsūshin, December 15, 1939. ↑ Advertisement in Shashin Bunka reproduced in Kokusan kamera no rekishi, p.68. ↑ The address of Echt was Tōkyō-shi Kyōbashi-ku Ginza Nishi-6-chōme (Kikuhon building) (東京市京橋区銀座西六丁目菊本ビル) and the address of Ishii was the same with no mention of the Kikuhon building. This was certainly the same physical location as in 1939. ↑ "Kokusan shashinki no genjōchōsa" ("Inquiry into Japanese cameras"), items 151–2. ↑ Advertisements in Ars Camera March 1946 (p.1) and April 1946 (p.1). The address was Tōkyō-to Kyōbashi-ku Ginza Nishi-6-chōme (Kikuhon building) (東京市京橋区銀座西六丁目菊本ビル). This was certainly the same physical location as in 1946. ↑ 8.0 8.1 8.2 Column in Photo Art no.80, June 1955, p.103. ↑ 9.0 9.1 Hagiya, p.10 of Kurashikku Kamera Senka no.64. Ars Camera. Advertisements by Ishii Shōkai in March 1946 (p.1) and April 1946 (p.1). "Kokusan shashinki no kōtei kakaku" (国産写真機の公定価格, Set prices of the Japanese cameras), listing Japanese camera production as of October 25, 1940 and setting the retail prices from December 10, 1940. Published in Asahi Camera January 1941 and reproduced in Shōwa 10—40nen kōkoku ni miru kokusan kamera no rekishi (昭和10〜40年広告にみる国産カメラの歴史, Japanese camera history as seen in advertisements, 1935—1965). Tokyo: Asahi Shinbunsha, 1994. ISBN 4-02-330312-7. Pp.108—9. Nihon Shashin Kōgyō Tsūshin (日本写真興業通信). Hyaku-gō goto jūkai no kiroku (百号ごと十回の記録, Ten records, every hundred issues). Tokyo: Nihon Shashin Kōgyō Tsūshin Sha (日本写真興業通信社), 1967. No ISBN number. Advertisement on p.41, corresponding to p.7 of the December 15, 1939 issue. Photo Art rinji zōkan: Kamera akusesarī zensho (フォトアート臨時増刊・カメラアクセサリー全書, Photo Art special issue: All the camera accessories). June 1955, no.80 of the magazine. "Denki roshutsukei" (電気露出計, Electric exposure meters). Pp.102–3.